General Aviation News will often reprint excerpts from US National Transportation Safety Board (NTSB) accident reports, including one from January 2011 that involved a Cessna 182 which got away from a (short) pilot in Meeker (Colorado). According to the accident report, the pilot was attempting to taxi to the runway. However, the Cessna began to move left faster than the pilot wanted to. He then attempted to apply the right rudder, but the aircraft failed to respond. So the pilot applied the right wheel brake, but the aircraft failed to stop and ended up slamming into a snow bank – leading to substantial aircraft damage (Luckily, there were no injuries). During the investigation, the pilot indicated that he probably did not have his seat positioned far enough forward in order to activate the rudder pedals or the brake pedals to their full extent. The NTSB then ruled that the pilot’s loss of directional control while taxiing was probably due to not have the seat adjusted correctly. Obviously it goes without saying that as with driving, its a good idea to adjust your seat, seatbelt and whatever else in your aircraft you need to adjust before you head out to the taxiway. 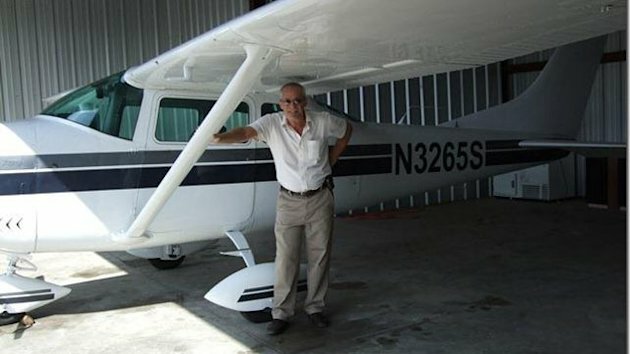 ABC News has reported an odd story about how pilot David Zehntner was doing a flyby of his home in a Cessna 182 Skylane and caught a thief in the act. David has a vacation home in Franklin (North Carolina) and a main residence in LaBelle (Florida) that’s under the approach pattern for the nearby airport. For that reason, David always makes a low altitude pass over his home on his flying trips. However and on his flight returning from Christmas vacation, David noticed a truck in the driveway. When he dropped down to 300 feet, he saw a guy walking around and looking into all of the windows and testing the doors of his home to see if he could get in. On the fourth pass, the thief looked directly at the aircraft, but he still attached David’s utility trailer to his hitch and took off with it. David’s wife suggested landing on the road, but the aircraft had three hours of fuel left. So instead, David tried but failed to get in contact with the local airport while his wife tried calling the police on her cell (it was to noisy to talk) – all while following the thief in the Cessna. The thief even stopped at a red light at a police station, but David had no way of alerting the police to the situation. When he saw the thief turn onto highway 80, David landed at the nearby airport and called the police who caught up with the thief. Fifty-nine year old Gary Robert Haines was arrested, charged with grand theft and released on $2,500 bond (no doubt before the paperwork could be processed according to one sarcastic comment on the article…). Police also found several loaded rifles and a handgun in the vehicle (which they are investigating) while David got his trailer back. Prior to departure the airplane was filled with approximately 24 gallons of fuel. An airport security camera recorded the airplane being refueled. The video showed that the pilot, after refueling, did not put the right wing’s fuel cap back on. During the cross-country flight, the Cessna engine lost power. The pilot attempted to conduct a forced landing to a nearby airport. The airplane did not have enough altitude to glide to the airport. It hit a light pole and crashed into a athletic field near the airport. Besides the fact that the pilot was caught on camera not putting the fuel cap back on, the on-site investigation found the right wing’s fuel cap itself on the ground near the aircraft’s wing (the left wing’s fuel cap was still in place). Moreover, blue streaks were found on fuselage and the right wing had fuel streaks that were consistent with 100LL aviation fuel being siphoned from the fuel tank during flight. In other words and the next time you refuel – be sure to replace and tighten the fuel cap! Max Trescott recently posted this video of a Cessna 182RG being reassembled after its landing gear was damaged in an accident. The video actually consists of several thousand photos taken over several weeks and these photos were put together into a two minute video to help viewers appreciate the amount of effort that goes into repairing even the smallest amount of damage. However, Max has also written a fair amount of detail about the aviation group doing the repair. Apparently, they are faith supported ministry who operate such aircraft all over the world and there are many interesting videos posted on the group’s Vimeo page. Moreover, their corporate blog details and includes plenty of pictures of some of the repair work they are doing on aircraft in Central and South America. In other words, they are not your typical aviation group and working for them as a pilot would definitely be interesting! Moody Aviation’s Cessna 182 Assembly from Paul Jones on Vimeo.